Check out our snazzy pins! This week we have some exciting events happening in our business services division, Voxox In Business, which provides VoIP solutions to small and medium sized businesses. Members of our team are in Chicago this week for the Channel Partners Conference and Expo. We are here meeting with our valued partners, who are our primary sales channel for our business offerings. And this isn't your usual business expo. Our new partner WTG has a carnival themed booth and agent event during the show, complete with fire breathers, stilts, jugglers and more. As a premier sponsor of their event, we're giving away two Apple iPads. We also like to keep our partners happy, so we are offering a $100 Visa Gift Card to every new partner when they make their first qualified sale (rules apply). Our talented design team created some out-of-this-world promo materials for the giveaway in keeping with the event's theme. Check them out below. We can't say enough about the beauty of these hand drawn illustrations. Great job Voxox creative team! So here's to a great event! 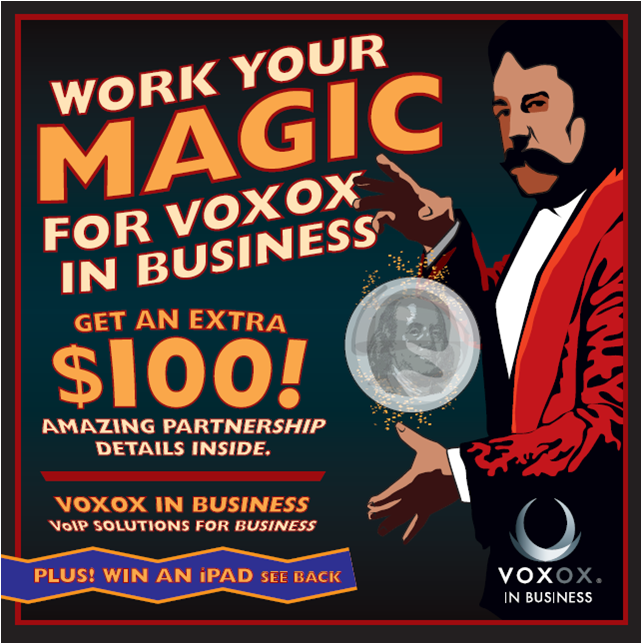 Check out our Voxox In Business Facebook and Twitter pages for more show and business product updates!